It takes only one halfling bomb and Offi Numminen’s world is turned upside down—or downside up, really, since he lives in a hole in the ground. His goth cardigans and aggressive melancholy set him apart from the other gnomes, as does his decision to fight back against their halfling oppressors. Suddenly Offi is the leader of a band of lovable misfits and outcasts—from a gryphon who would literally kill for omelets to a young dwarf herbalist who is better with bees than with his cudgel to an assertive and cheerful teen witch with a beard as long as her book of curses—all on a journey to the Toot Towers to confront the dastardly villain intent on tearing Pell asunder. These adventurers never fit in anywhere else, but as they become friends, fight mermaids, and get really angry at this one raccoon, they learn that there’s nothing more heroic than being yourself. 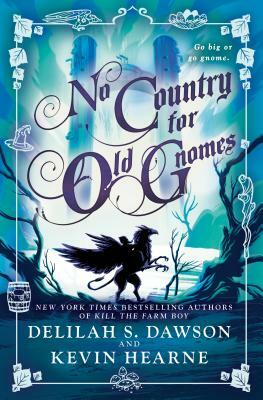 In No Country for Old Gnomes, Delilah S. Dawson and Kevin Hearne lovingly tweak the tropes of fantasy and fairy tales. Here you’ll find goofy jokes and whimsical puns, but you’ll also find a diverse, feminist, and lighthearted approach to fantasy that will bring a smile to your face and many fine cheeses to your plate. Kevin Hearne hugs trees, pets doggies, and rocks out to heavy metal. He also thinks tacos are a pretty nifty idea. He is the author of A Plague of Giants and the New York Times bestselling The Iron Druid Chronicles series.